Three first-time semi-finalists from the St Annes Old Links Club will join Fleetwood’s two-time champion Chris Boyes in Portugal to compete for the 2018 Gazette Matchplay crown, again generously sponsored by Blackpool taxi firm Blacktax. 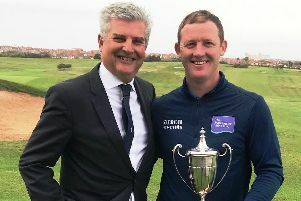 After five rounds of keenly-fought competition around the Fylde coast, the last eight went head to head at Lancaster Golf Club on Monday, when Old Links’ Steve Heyes became the first player to win a quarter-final on an extra hole in this annual event. 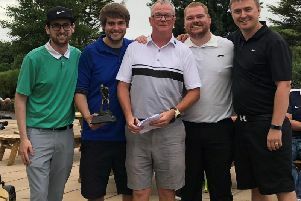 Steve’s fellow winners were his clubmates Chris Nay and Mark Townsend, together with Fleetwood’s Boyes and all four will fly out to the Algarve on September 27 to battle it out for our champion’s trophy. Their destination will be the Pestana dom Joao resort on the beach paradise of Alvor, where they will enjoy three nights’ accommodation with breakfast and dinner. All this and the flights/transfers will be fully funded by our ever-generous tournament sponsors Blacktax. Our semi-finals and final will be contested for the first time at the nearby Silves, Gramacho and Vale de Pinto courses. Those counting down the days include Steve Heyes, who qualified the hard way, by winning the first extra hole against North Shore’s John Gibson, having been two up with two to play. After defeating last year’s champion Elliot Lavin on his way to the last eight, Steve held his nerve as his match against fellow 10-handicapper John went into extra-time, the unlucky Gibson then losing his ball off the tee. St Annes-based gardener Steve said: “We both played good and bad holes but it was good, close game in good company. I was ahead most of the time by one or two holes but John came back. Fellow Old Links member Townsend twice came back from four holes down in the earlier rounds but had no such problems at Lancaster, where he won a good match against Fleetwood eight-handicapper Glenn Wellard 2&1. Mark, who works in the construction business, admits his course knowledge after three years as a Lancaster member helped him to win in our quarter-finals at the second attempt. And he was pleased with his performance under pressure. Mark said: “I had a good start, winning the first two holes. I kept plugging away steadily and was three up at the turn, after birdying the eighth from 10 feet. Completing the Old Links trio bound for Portugal is Chris Nay, the head sports coach at St Annes YMCA who defeated Fleetwood’s Geoff Davidson two up. “I didn’t drive well but I played the par threes well and did what I needed to do,” said St Annes-based Chris of his victory over 11-handicapper Geoff. A beaten quarter-finalist 12 months ago, Chris hopes this will be his lucky year. And Lady Luck’s assistance is most welcome, as he explained: “We’ve had our second child this year, a girl, so I haven’t been able to play much and I’ve been lucky to get byes in the third and fifth rounds. Two Fleetwood players bowed out in the quarter-finals but Boyes will fly the club’s flag in Portugal, where he bids for a hat-trick of Gazette Matchplay titles following his wins of 2010 and 2012. Chris, who was runner-up on his third visit to the Algarve for our finals last year, defeated fellow six-handicapper Jason Fallan from Herons Reach 5&4. Store manager Chris from Thornton has played in every round but has been in consistent form throughout the season, his only close call a 2&1 win over Dave Kershaw at Knott End. Chris said: “I was pretty steady all the way round in the quarter-final. I didn’t make any birdies but the tactics were to keep the ball in play, find the greens, make pars and keep the pressure on Jason.